The UCAN Club volunteers help low-income families learn how to select, prepare, consume, and store healthy food on a tight budget. Children and adult participants will learn to cook with crock pots, microwaves, blenders and other appliances. We need volunteers to help homeless families learn these skills, fundraise/market, and serve on a UCAN Club committee. Time commitments vary. Click here to learn more about the UCAN Club. We serve 94,900 individual meals per year, in large part through the efforts and generosity of volunteers/donors. If you or a group would like to sponsor, cook, and serve a meal, please check out our Meal Sponsorship page for more information. 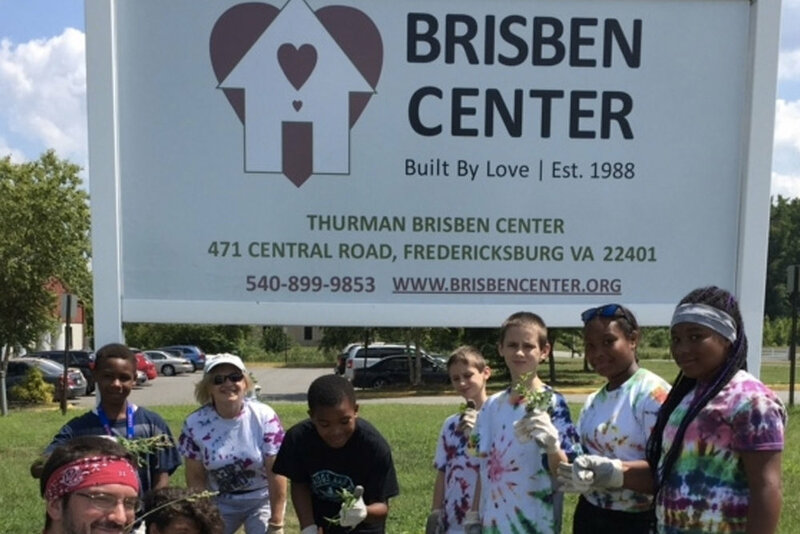 The Brisben Center depends heavily on our large number of highly committed volunteers and supporters from across our community. For example, our volunteers and their groups serve nutitious meals to 80 residents and 20 guests every day of the year. Not only do they serve the meal, they also donate, bring and prepare the food in Brisben's kitchen — then Brisben's residents clean-up. More than 70 faith-based and civic organizations, representing hundreds of individual volunteers, support this major endeavor. These program opportunities help our clients achieve and maintain self-sufficiency and independence. There are many more examples of our volunteers at work in a wide variety of ways. Our volunteers support staff in aspects of operations and successfully deliver a wide range of approved voluntary programs that assist our clients. These program opportunities help our clients achieve and maintain self-sufficiency and independence. Because of our dedicated staff and our volunteers, all clients who enter our doors have access to assistance with obtaining housing and employment, and opportunities to build life skills, participate in recovery programs, secure a GED, acquire financial literacy/budgeting, and address medical issues. Families with children have access to this same assistance along with additional services such as arranging for schooling and transportation for school-aged children, day-care assistance and parenting classes. Please review our list of volunteer opportunities. We have many interesting and fulfilling ways to help. Occasionally, we have a part-time paid position. Note: Some of our opportunities are for volunteer coordinators, others would involve a small group of your friends or associates. We have limited volunteer opportunities at the Center for minors, and only if they are accompanied by a parent. We do offer an opportunity for children and early teens to serve by organizing a drive and delivering badly needed items to the Center. We always have volunteer opportunities, so check-in regularly at this site and/or sign-up for our E-newsletter by sending an email to info@brisbencenter.org. CLICK HERE to view our Immediate Needs list — many items that you can pick up when shopping. ORGANIZE A DRIVE — ADULTS, CHILDREN AND EARLY TEENS — Your kids or family can organize a drive to collect badly needed items for the homeless men, women, and children at Brisben. From pillows and towels to cereal and snack tubs. CLICK HERE to view our Immediate Needs list. Keep it simple with a family drive, or engage a couple of friends, a club, a team, or your class. Let us know when you're coming to bring the items to the Center and we'll give you a tour. — Organize 3-5 associates and serve a lunch meal at Brisben on a Saturday or perhaps during a weekday. — Have a larger group and want to serve a future dinner meal? Contact Joe Hargrove at jhargrove@brisbencenter.org regarding lunch or dinner programs. Email info@brisbencenter.org if you have questions or you are interested in any of the positions below. Social Media/Facebook Coordinator (volunteer position) We need a social media savvy volunteer to manage and maximize our social media presence. Are you experienced at building and maintaining an active social media presence? This is an opportunity to play a part in the amazing Brisben story. Email us at info@brisbencenter.org . Volunteer Drivers (volunteer position): Have a car and 3 to 4 hours of volunteer time once a week? You can make a difference by driving residents to the doctor, the pharmacy, job interview, or government office. Email us at info@brisbencenter.org . Retired Professionals Wanted (volunteer position) — Do you have 2 to 3 hours available each week? Email info@brisbencenter.org and let us know about your talent and skills. Resource Development Support (volunteer position) — Help the Brisben team maximize and further develop its broad range of existing resources. Thank you for considering the Thurman Brisben Center. Our volunteers give their most precious commodity — their time. They are our community's helping hands, serving those with the greatest needs.